As parents, it would give us the greatest of pleasures to see our children grow up to be kind, good-hearted individuals. But how exactly does one human being teach another to be kind? Being kind ourselves is one way. In our children's eyes, our every word and action is scrutinized and magnified for future reference. If we are kind to others, our children would take that as a cue and practice kindness as well. Another way is by giving our children opportunities to practice kindness. After all, one of the best ways to learn something is to actually start doing it. Ginger Roxas-Arzt, mom of two and board member of Childhope Asia Philippines, shares a number of activities which she and her husband enjoy doing with their kids while imparting the values of compassion and kindness. Childhope Asia Philippines is a non-stock, non-government, and non-profit organization that has been working to ensure the welfare of Filipino street children for more than two decades. Ginger also gives her children carefully curated and age appropriate books, which are mostly focused on loving adventure and knowledge and building friendships, and involves them in celebrations by letting them write thank you notes and wrap presents for birthday celebrants. In partnership with Mommy Mundo, Childhope Asia Philippines gives parents a wonderful opportunity to teach their children how to care for others by creating meaningful experiences through its Kindness Campaign. 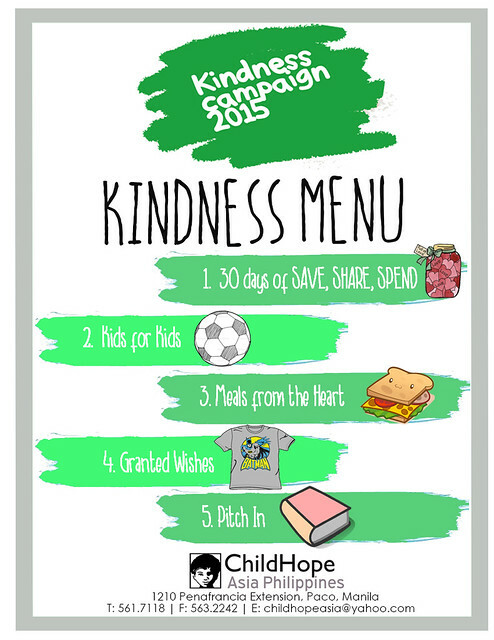 Childhope's Kindness Campaign is sheer genius in its simplicity. It starts off with just three cans, which will henceforth be called Kindness Cans. Parents are encouraged to label recycled jars or cans with the following tags—SAVE, SPEND, and SHARE—and invite their children to fill up the cans with change from their daily allowance. The SAVE can builds the idea of setting aside money for the future. The SPEND can serves as a fund for things and experiences they want to enjoy. The SHARE can is for bringing joy to others. 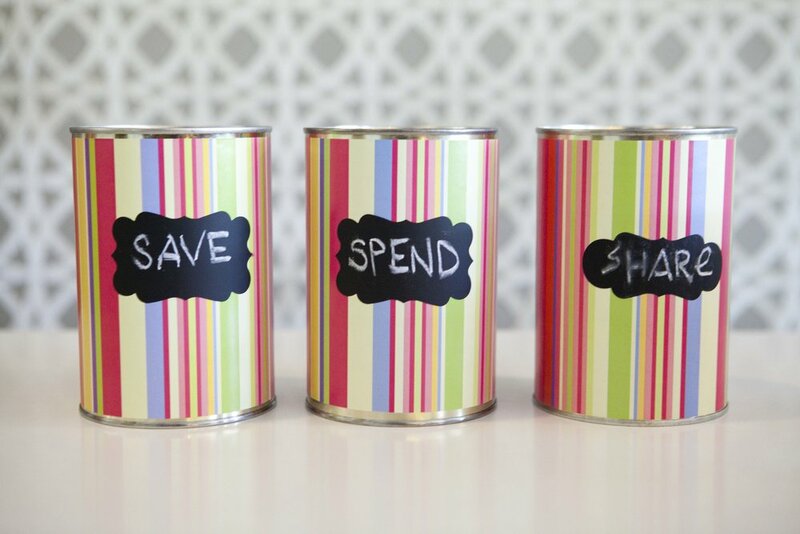 By using everyday objects such as jars and cans, the concepts of charity and financial stewardship are made easier for children to understand. “We just started our son on the Kindness Cans a couple of months ago primarily because he has been asking for an allowance since his 6th birthday,” says Ginger. “Coming from a strong belief in nurturing altruism in kids, I wanted to add a charity element to it and asked my husband if we could use the Childhope Kindness Cans. After computing it, we decided on 10 percent as his weekly contribution to his SHARE can. He puts 100 in his SAVE, 100 in SPEND, and 20 in his SHARE can. Every month he gets a 1 percent interest back for savings, a very basic lesson in finance and philanthropy,” she says. * Join one of Childhope Asia's feeding programs. Childhope Asia provides educational and welfare services to street children from Tuesday to Saturday. It also gives the little ones a meal. Your family can sponsor the meal for any one of these days. * Celebrate a family member's birthday with street children. Let your children select the food and treats to be included. Seeing the smile on the street kids' faces as they eat spaghetti and play games will certainly warm everybody's heart. * Use the SHARE fund to make care packages for street kids. The package may include clothes, slippers, toiletries, toys, and books. Of course, Childhope Asia will be more than happy to receive donations of old toys, clothes, books, school supplies, and other gently used items. Encourage your children to participate in their quarterly garage sale, and they'll see how their pre-loved clothes, toys, and books maybe used to help others. But nothing will be as powerful for you and your children as participating in Childhope's various activities. As young volunteers, your children can assist in weekend feeding programs, story-telling sessions, and fundraising events. By immersing themselves in such activities, your children will experience the wonderful feeling which kindness brings both to the giver and the receiver. 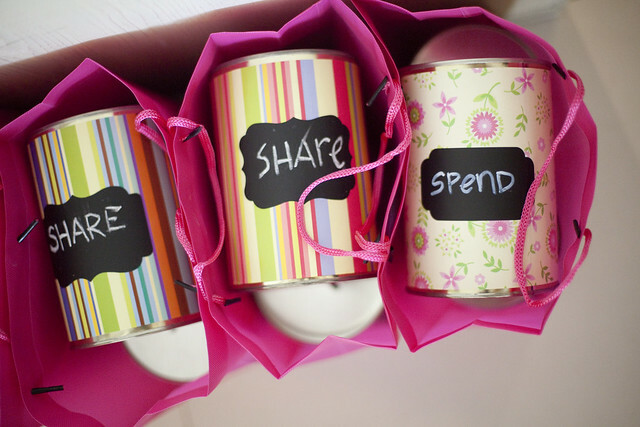 Childhope has ready-made Kindness Cans for busy moms and dads to purchase and use immediately. Contact Mylene Lagman at 561-7118 or email childhopeasia@yahoo.com for more information. Mommy Mundo will be accepting filled up Kindness Cans at the Mommy Mundo Headquarters at Fun Ranch in Frontera Verde, Pasig City and at Expo Mom happening May 22 to 24 at the Glorietta Activity Center in Makati City. Donations in cash or kind are also most welcome.